Great New Udon Assembly Line! My pal and I were hungry and bored this evening and so decided to make for some good old Udon. I read about this place recently and wanted to check it out ever since and so we decided for ‘Tamoya Japanese Sanuki Udon’ at Liang Court. The place has an unspectacular cantinelike setting and the ordering process has something of an assembly line. I ordered a large bowl of ‘Kitsune Udon‘ (Fox Udon) that come in a deliciously light broth and are topped with sweet ‘Aburaage‘, fried tofu pockets. 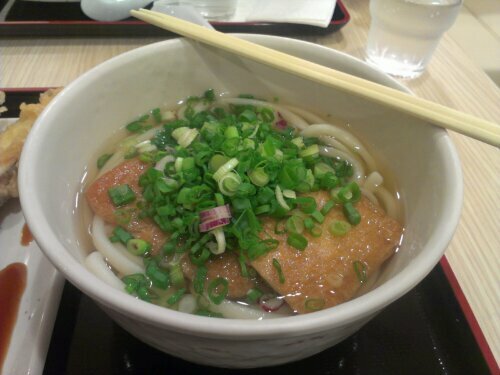 The udon were nice and chewy and surprisingly long, perfect for noisy slurping. I stocked up properly on the negi from the self service counter and finished the whole bowl down to the last drop. Only the tofu was a bit too sweet for me but I guess that one was called for. Even that I am not a big fan I still had some ‘Eggplant and Sweet Potato Tempura‘ aside which were tasty and crisp. I liked the sweet potato more as the eggplant was a bit blend and too soft. I am nearly as much an Udon fanatic as I am with ramen and so I am happy Tamoya has decided to come down to Singapore. I’ll be trying some of the other types in the near future so watch this space. can’t wait to be there for a udon meal 🙂 cheers!